The idea for duckybots started from a conversation at the Boston Robotics Meetup with Meredith Garniss. In addition to trying to involve kids in robotics, we thought it would be good to inspire the adult robotics crew to create for kids. Programs like FIRST robotics, and school programs are already full of people interested in STEM and robotics, and we wanted to find something that would turn kids on to the joys of Science and Engineering. The basic idea is to use turning rubber ducks into robots as a platform for experimentation, creativity and learning. Rather than presenting them with a blank slate, I put together some modules that represent different propulsion types. 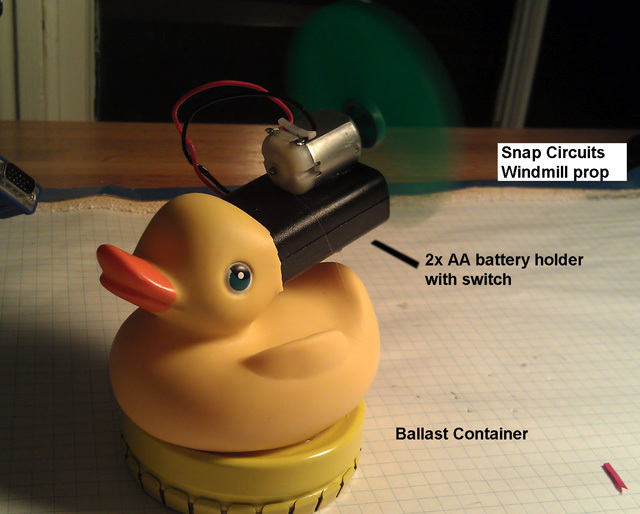 I created a fan unit from a toy motor, a AA battery box (with switch) and a fan propeller sold as a spare for snap circuits. I also had some playmobil underwater motors, and lots of Duck(!) tape (especially yellow). As kids strapped on the motors, and found the ducks tipping over, presenting an engineering challenge! I also had some closed cell foam (from packing materials) that they could use for floats, and outriggers. I was thinking that this was a good test to see if I should spend any more time on this, and I think the answer is yes!